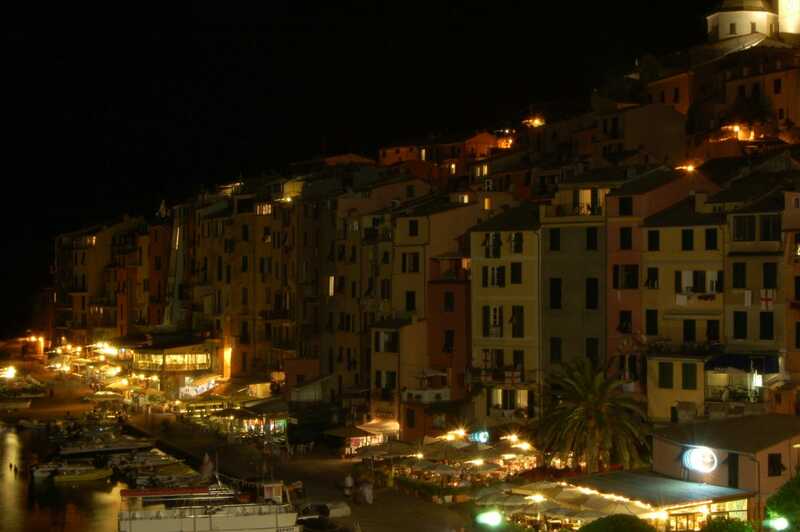 After several more days and locations (Florence, Cinqueterre via Portovenere) I am left with one question: Why is it that even supposedly elegant European hotels charging many hundreds of Euros a night for a room are oblivious to the quality of their beds? I am getting tired of paying tons of cash for rooms with bed linens whose quality is measured in "grit" rather than "threadcount." The beds are uncomfortable and the pillows are awful. The blankets are sick polyester jokes that Motel 6 would be embarrassed to offer. For the price of just one night's room rent I could go to IKEA and outfit the rooms better. It's not like I am some spoiled princess-and-the-pea sleeper -- I stay in a lot of cheap hotels and I tent camp, for god sakes. My camping equipment is more comfortable than these beds. I routinely stay in $70 hotels in the US and never get beds or linens this bad. Do they not care, or is this what Europeans all sleep on at home? Seriously, I wonder if I could have -- without a) any kind of materials strength data base; b) no structural steel or modern concrete; c) no CAD facility -- designed and built such a thing in the 1400s, even with the Pantheon as a go-by to copy. Really remarkable. You can't tell from this picture, but the bridge (open only to pedestrian traffic) is lined with at least 40 jewelry stores. Seriously, each storefront has bout 6 feet of space, and every one had a window with zillions of gold trinkets. It got me thinking about the paradox of choice. It's not hard to buy into the economic theory that too much choice may inhibit purchase while walking along this bridge, though I am told most of these folks do very well (I have never bought into the paradox of choice as social theory -- the one that says people would be happier with fewer choices. If this were true, we would all be emigrating to North Korea). Speaking of pedestrian streets, one important takeaway from Italy has been that one should never assume a road is too narrow, even if it is no wider than your pantry door, for a vehicle to come racing through any second. The other day I was in a really narrow alley I thought was foot-traffic-only when a bus(!) came screaming down the lane like a piston through a cylinder. Only a well-located doorway got me out of the way, and even then the bus's mirror clipped my arm. 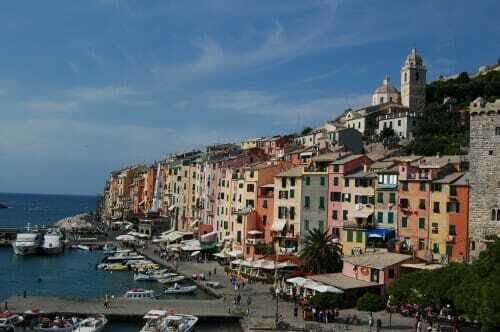 The last few days we have been staying at the port town of Portovenere on the Italian Riviera. I have some other exposures that I want to try with HDR software to try to bring out a bit more of the buildings. The town was kind of fun on a Saturday night -- in addition to a couple of rowdy weddings, there were also a lot of BIG boats that came in for dinner in the evening. Very nice (except for my bed). 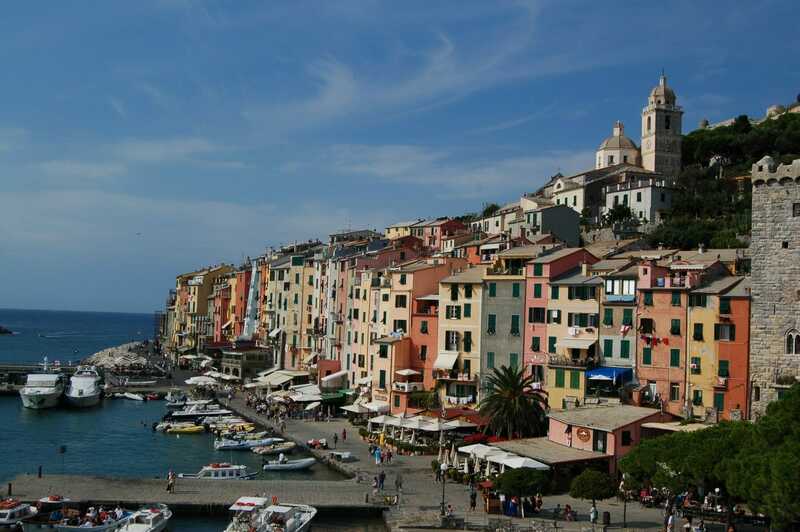 Portovenere is a convenient gateway to the Cinqueterre, five absurdly picturesque downs laid down in about 1100 AD by Walt Disney to attract American tourists. You may have not heard their names, but you have likely seen one or all of them the last time you were at an art fair in one of the photo exhibits -- here is one example (though they had the patience to wait for a time of day where the lighting was better, presumably in the early morning). It is hard to tell, but its a little one-person monorail that rides on the rail and pulls a couple of carts behind the "engine." This is why I could not find any roads or really many trails in the vineyards -- they use these cool things to move about, do maintenance, and bring in the crop presumably. 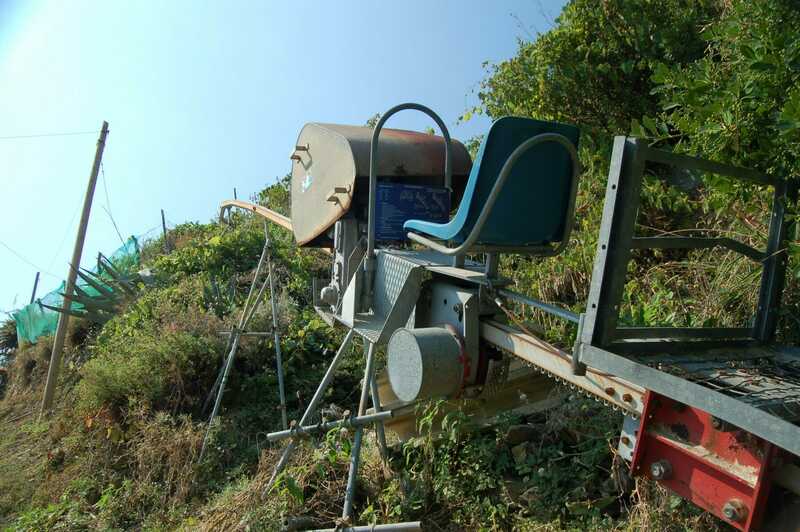 And the rail does not run on the ground, but 4-5 feet in the air, so one can see over all the vines and brush. Totally awesome. And not a seatbelt to be found on it, which made me love it all the more. I loved it so much, here is another shot head-on (sorry it is overexposed, I don't have the energy to edit it right now). There are certainly some wonderful buildings that survive. But my guess is that there were plenty of terrible buildings built back then -- they just all fell down. Only the best things survive. This has a lot to do with "they don't make 'em like they used to", in my opinion. There was a lot of crappy stuff built in days of yore, it just didn't survive. The good stuff that endures is great, to be sure. But those are the best examples of craftmanship. What Rick Steves won't or can't tell you. While in Germany I entertained myself several times by examining and pondering the installation of modern technology (plumbing, wiring) in 700 yr old buildings. No surprise in the cities bombed to rubble. These sort of urban renewal. But intriguing other places. You're bang on with the fitout of even quite expensive hotel rooms in Europe; it's been a bane of every trip there. The strategy is obviously only possible in the larger cities. At the risk of stating the obvious; tripadvisor reviews, while of variable use for most things, generally mention fitout if a place is bad so can be a good litmus test. DMS's comment, above, suggesting international chains is apposite. Europeans, for some reason, expect paying tourists to consider themselves privileged at the opportunity of sharing in the admittedly rich culture and history. I'm glad your unhappiness is restricted to bad beds and not to abysmal service response to entirely legitimate complaints. I guess history and culture do all the lifting with regards to drawing people in; the hospitality industry, ofcourse, getting by with doing the bare minimum. "Europeans, for some reason, expect paying tourists to consider themselves privileged at the opportunity of sharing in the admittedly rich culture and history." Tourism in Europe is still for most an extravagant luxury, people are glad to get the funds to go on a trip at all and are unlikely to complain if the bedsheets are no better than what they get at home (and yes, most of us have relatively rough linen and cotton sheets, not the slick cotton or silk that seems common in the US). So If you get a bed and sheets like that in a hotel (even a quality hotel) in Italy or elsewhere in Europe, remember it's below standards only by your standards, not by the standards of the local population (which include the hotel staff, owners, and designers). I'm still baffled when entering a US hotel room and finding 2 double beds with slick soft sheets and down pillows, marketed as a 2 person room in a middle class hotel. Different cultures, totally different standards of living. My house in the Netherlands is considered large for a single person to live in (it's designed for a family of 4), but in the US would be considered small even for a short term rental (it's not, it's a permanent residence). Do remember that our incomes are a lot lower than our those of our US counterparts, and our taxes a lot higher. As a result, disposable income for most Europeans is maybe 40-50% at most of what an American with a similar job would have, corrected for different retail prices. So if you have a $100k yearly income (after taxes) in the US, your European counterpart has maybe â‚¬30k (after taxes). that's a major difference, and accounts for much of the lack of luxury you perceive. To your European counterpart, that hotel room is quite luxurious, well worth the cost for the long weekend he can afford to visit Florence once every 5-6 years. 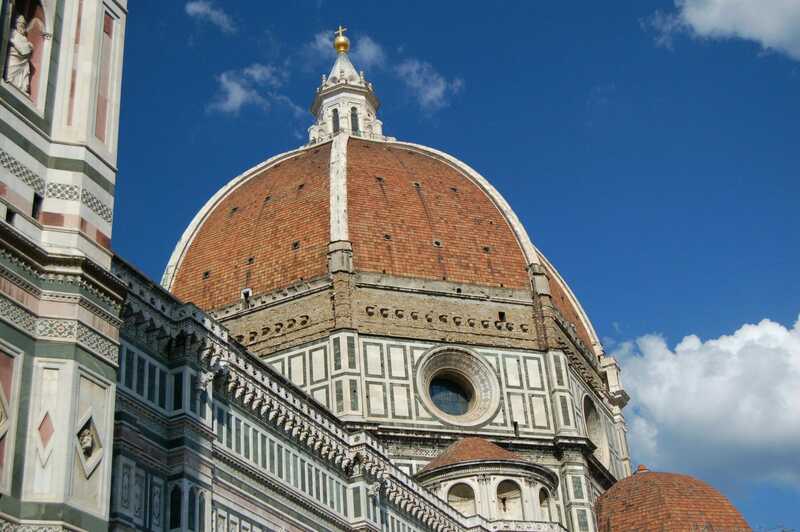 Santa Maria del Fiore -- it's still the largest masonry dome ever built. Good for you, man. Not just everyone gets to see that in their lifetime. I've only been over to Europe once, and stayed 2 nights in Versailles. I can echo that the room was worse than just about anywhere I've stayed in the US (seriously, it was on par with a highway motel, but smaller). I didn't mind the size, as I know Europeans aren't used to the expanse of square footage that we've grown accustomed. But even after a visit to an NYC hotel, I was struck that while the NYC hotel room was just as small (if not smaller) than the Versailles room, it was much more finely appointed and clean. My wife is a hotel snob, so I've stayed at some ridiculously nice places in the US. But still, my typical business travel hotel (Hampton Inn) is nicer and cheaper than anything in Europe. Your comments on narrow roads and vehicles reminds me of an incident that happened in my 1970 hippy tour of Europe. I can't remember the exact location, but it was a medieval town, probably somewhere in France. I was walking up from where we parked the Beetle towards the town, and was accosted by an American man, traveling with his family. I guess we didn't look as European as we imagined. He immediately began telling how stupid the people who built the town were. We began walking back to the scene of the purported crime. The entry road to the town was narrow, as they always were back in the day. He had entered the town in his Cadillac (and Eldorado, if I remember right. They were huge in the original incarnation) and noted that the street was barely wide enough to drive. The street narrowed, so he put the right wheels up on the sidewalk. It narrowed again, so he put the left wheels up on the other sidewalk. It narrowed more. By then we arrived at the car. It had the nose of the car wedged in between the walls of the buildings so hard that the front fenders were v'd in. I asked him why he didn't stop. 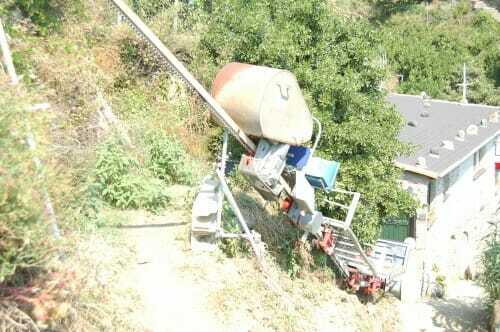 He said that it never occurred to him that anyone would be so stupid as to build a road that was too narrow to drive on. I was at a loss of suitable words to reply. 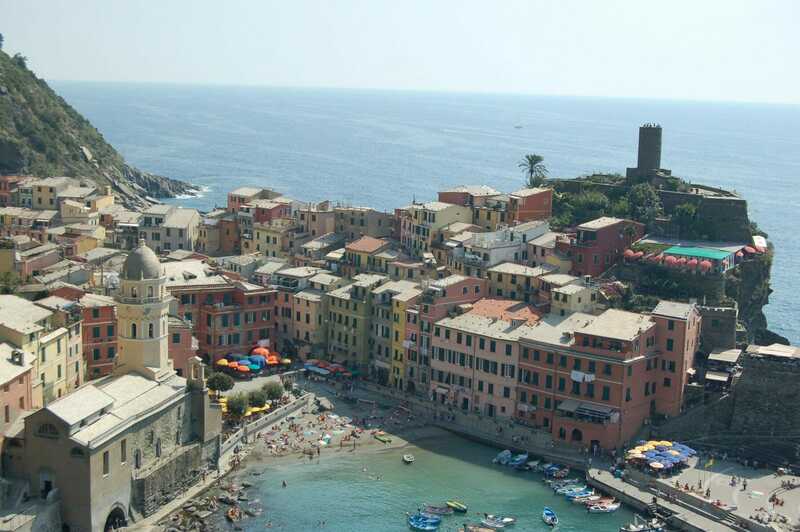 It sounds like you really got to enjoy the cinque terre, the key to it is walking, we went pushing a stroller so could only walk on one trail, the rest by train.doh. 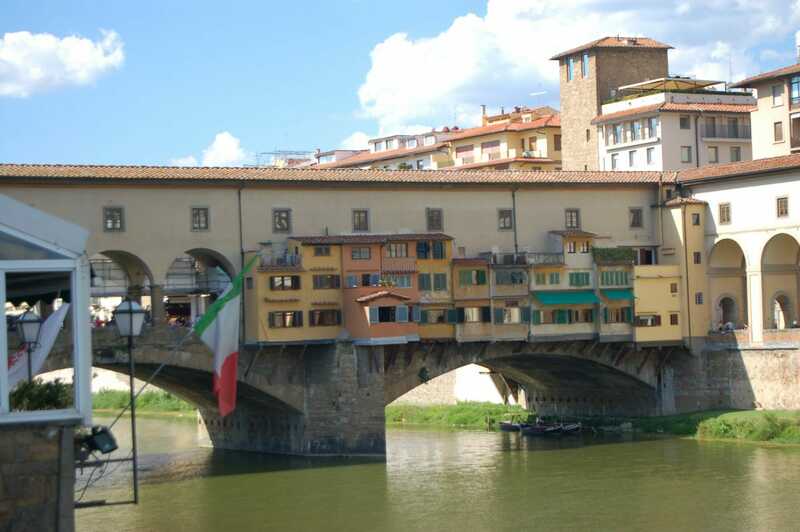 if you're going back to tuscany, the towns of pistoia and prato are easy walks from the train station, and you can see most of the towns in 3 hours. In Pistoia the Tau chapel is super cool just because the medieval frescos are the obvious source for the ideas of sistine chapel. If you're going to Pisa I really thought the campo santo was worth the visit, it's something that I had never heard of, but just the fragments of fresco remaining (last judgement) give you an idea of what was there. Dave Barry once wrote that when driving in Italy, you are often assured that you are on a proper roadway (rather than, say, a sidewalk or crawlspace) only by the fact that occasionally, an Italian driver will pass you. Regarding sheets in hotels, I can agree that US standards for bedding run much more to the comfort level than in Europe. We imported our US beds here to France, and have not regretted it, even though we have to bring back sheets from the US on our occasional trips back. And if you really want to suffer on bad matresses, cheap French hotels are absolutely the worst. Great pictures ! Thanks for sharing your impressions on this trip. You do sound "very American" :), but I like the way you write ! Do take notice of the quality thread count you will for table linens in Italy. While the bed sheets may be basic, even the most common eatery will put linens on the table that only fine restaurants in the United States would use. I believe the Italians prefer their luxury spent during the waking hours. I just had some friends return from Italy tonight and one the first things they said were that the beds were uncomfortable.